Amazing memories are waiting for you at Big Timber Lodge. Shooting stars light up ink dark nights away from the hustle and bustle. Views of Fontana Lake from the hot tub, and elegant furnishings complete the experience. 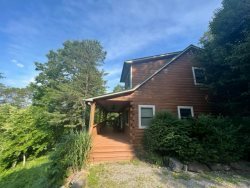 Big Timber Lodge has all the amenities for your perfect vacation: a fantastic view looking out to the Great Smoky Mountains and Fontana Lake, the hot tub on the deck, a full kitchen and more! 3 Bedrooms & 2.5 Baths: The master bedroom has a king bed and a TV. The upstairs second bedroom has a queen bed and a TV. The upstairs third bedroom has a queen bed. Both bathrooms have tub and shower combinations. You'll love the all wood interior that gives Big Timber Lodge its name. The inside stone fireplace with gas logs illuminates the living room any time of year, and the leather sofas are great for relaxing and enjoying the Satellite HDTV or catching up with loved ones. Enjoy the great outdoors to the fullest! Whether you're taking in the outstanding view from the deck, relaxing in the hot tub, or grilling your next meal, Big Timber Lodge is the place to be. With the view you'll remember, Big Timber Lodge is conveniently located in Almond, just minutes from the Great Smoky Mountain Railroad in Bryson City and white-water rafting on the Nantahala River. We loved everything! The cabin is absolutely beautiful and perfect for our family of 4 with such a gorgeous view! It was a great Spring Break! Big Timber Lodge was absolutely perfect for our visit to the Smokies. The cabin is gorgeous and has a wonderful view. The beds are very comfortable and the cabin had the basic needs for our stay, including laundry, kitchen basics, hot tub and a bunch of classic DVDs which we enjoyed with our kids! They were very helpful and responded very quickly to all my questions, including making sure we came in a safe route since we were coming in very late at night and there are no street lights on the mountain. They weren't kidding, it is incredibly dark up there and the road is full of hairpin turns. Makes for the great view but can be a bit of a thrill if you're not used to that kind of driving. The location was wonderful for our day hikes and visits to the dam, Bryson City and various parts of the park. The kids loved that their rooms were on the third floor (loft area), while the master was on the first (you enter the cabin on the second floor) so they had their privacy. The one thing I did notice was that that hot tub is above the master bedroom and the hum could bother some when sleeping. The cabin was gorgeous! Very clean with a lot of personal touches. The view is absolutely breathe taking. We enjoyed being in the hot tub under the stars. We spent the weekend relaxing - unwinding from all of the day to day stuff, watched movies, napped, and enjoying this quiet peaceful place. We will definitely go back! The kitchen was fully stocked with all major dishes, pots, baking pans etc. Even included an Ingles Advantage Card for discounts. Our favorite thing about this stay was the Hot Tub, Fireplace, Amazing views and couple alone time. We stayed in the cabin most of the time. Cabin was extremely clean and decorated very nicely. We enjoyed the Hot Tub multiple times. We will be back!! From the exciting drive to cabin to the incredible views you will not be disappointed. Awesome trip all and all. Love the incredible views. Thoroughly enjoyed hot tub. We will be returning!! We loved the cabin and the amazing view! We made smores in the outdoor fireplace and cooked out on the grill several nights. Loved all the shops downtown and gem mining at the Nantahala River Gem Mine. Visited the beautiful waterfalls at the Great Smoky Mountains and Fontana Dam. We will be returning for sure! The cabin was beautiful and very relaxing. The view was amazing and I truly enjoyed the days we spent there. We had everything that we needed. Gorgeous view. We came to show our Show our city-based grandchildren the real America. Very helpful staff, particularly when we had a glitch on our end. Our first cabin had a water issue so GSCR moved us to Big Timber Lodge and it was a dream. We loved sitting in the hot tub and watching the sunset. We enjoyed going to fontana Lake and the Oconoluftee River. We highly recommend both. We couldn't get enough of the view from this cabin. Great place we hope to stay there again soon. The cabin was comfortable with great views! The team was excellent! We went hiking, rode railroad,did a boat rental on the lake and enjoyed our vacation! Simply amazing. We rent cabins and houses around the world and this is by far one of the best. The view is amazing, the house beautiful but most important is the attention to detail. We felt very welcome and that somebody really cares about our experience. We had a great experience. The view was breath taking. whitewater rafting was awesome, along with hiking. The cabin exceeded our expectations. We loved the space, the view and the privacy. We had a great time. The cabin exceeded our expectations. It had everything we needed and a fully equipped kitchen. The view from the deck was amazing. A truly memorable experience! We enjoyed our stay at Big Timber Lodge. It has the best views and is so beautiful and wonderful here. Thank you for sharing! We loved the cabin and the views of valley from living areas. Agent always available via phone. Big Timber Lodge is a beautiful cabin with a great view of the lake. It's a perfect cabin for a family of six. We had three adult couples in our party. We always rent properties that have hot tubs. Great for relaxing and enjoying the view. We have rented from GSCR before, and our experience has always been good. We loved our time here. It's such a relaxing place to stay with the beautiful views everywhere you look. We drove to the Road to Nowhere, Sylva and Bryson City and had a lovely time. We enjoyed our time in the Hot Tub and cooking delicious meals in the kitchen. It was a wonderful one year anniversary! The cabin had beautiful views, comfortable furnishings and lovely outdoor spaces. It was immaculate. We enjoyed the outdoor fireplace and the spectacular views! Never in my life have I ever had such a beautiful place to stay. The view is fantastic. If we ever plan another stay in the area, it will be here. Thank you for such a wonderful experience. A woman called to check on us after we had checked in. She was very genuinely friendly and made it clear it was no problem for us to call if we needed anything. We loved the cabin. We enjoyed cooking in the beautiful kitchen. What a beautiful cabin and view for our first stay on the NC side of the Smokies.